Sign Up for our Newsletter & Receive Coupon Codes. 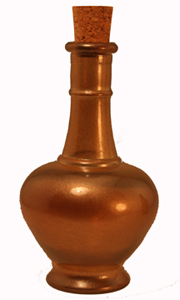 8.5 oz Gold Aladdin reed diffuser bottle is a classic style in reed diffuser bottles. 8.5 ounces Height 6 1/4". Diameter 3". Capacity 8.5 oz. Opening 3/4". Suggested oil amount 4 to 6 oz. For long-lasting fragrance it holds 8.5 oz Gold Aladdin reed diffuser bottle. 8.5 ounces Height 6 1/4". Diameter 3". Capacity 8.5 oz. Opening 3/4". Suggested oil amount 4 to 6 oz. | No reviews for this product yet.